Reining in mom’s crochet project bags. Okay so some of you may have noticed a post went up that didn’t have much to say and then was deleted. Yes, I did that. I started the post and had set it to be posted, but didn’t finish writing it and then changed the date for it to publish (or so I thought). Imagine my surprise when I saw that it posted! I quickly deleted it since there really wasn’t anything there to see. So now I will tell you all about the Christmas crafting I did for family this year. You know when your parents get to a certain age that there isn’t much that they need and it is difficult to figure out what to give them as gifts? Well mine are at that stage so I often struggle with gifts for holidays and birthdays for them. For my dad this year I got him car wash coupons (believe me he was thrilled). 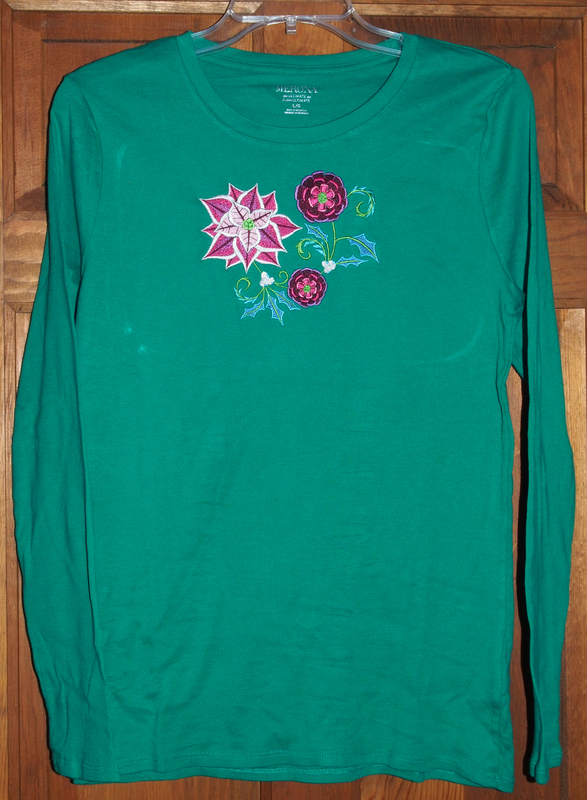 My mom was a tougher nut to crack so I put my crafty hat on and decided to embellish a couple of t-shirts with machine embroidery for her. 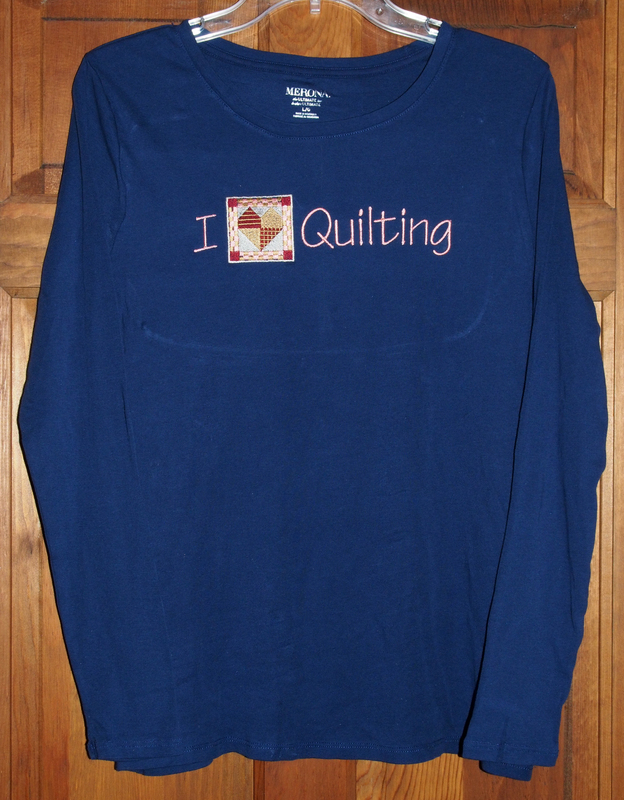 You may remember in September when I embellished a couple of t-shirts for the “Tale of Two Cindy’s“, well I didn’t want my mom to feel left out of having her own I ♥ Quilting t-shirt. I decided to not make it identical to the “Cindy” t-shirts by just changing the color of the shirt. 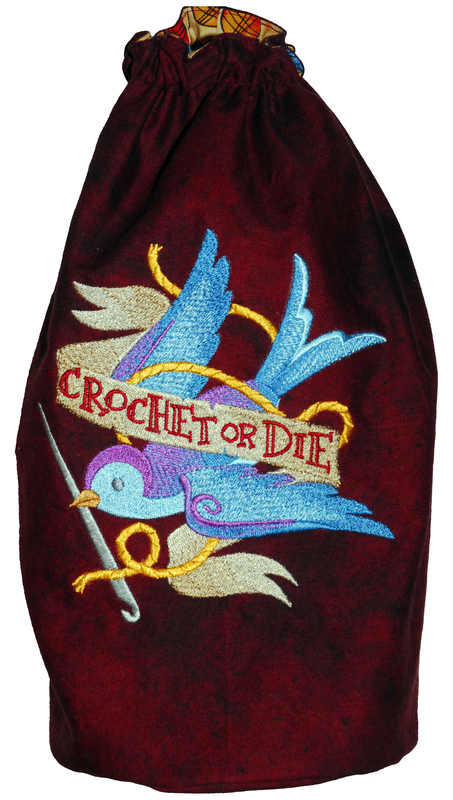 I used the same colors for the embroidery but changed the lettering to one of the lighter colors. She was thrilled to get her own I ♥ Quilting t-shirt. My mom loves to wear seasonal clothes so I decided to make her a Christmas/Holiday style t-shirt too. Last year I used the Jacobean Christmas Designs from Embroidery Library to make a holiday t-shirt for me and another one for a friend. 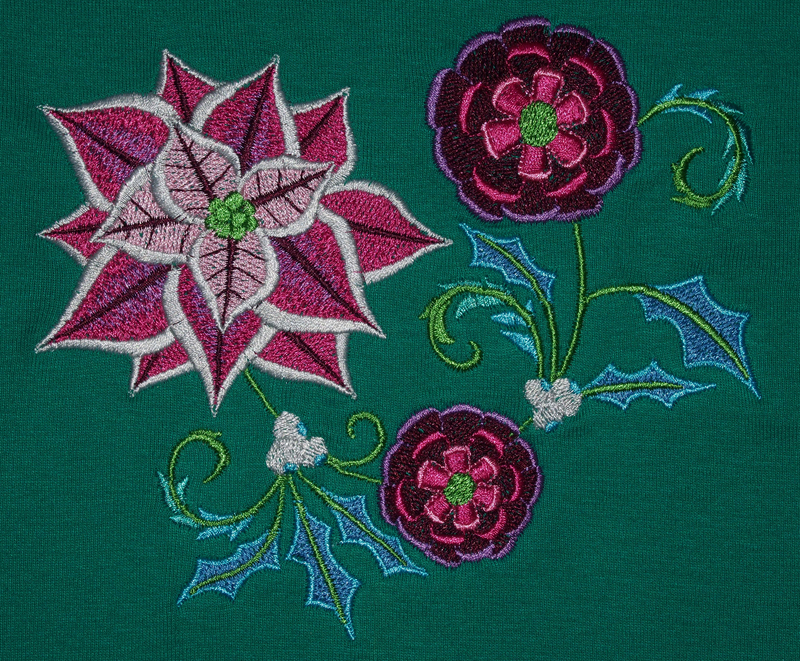 I love the designs in this set and chose one with a poinsettia and holly for my mom. Again it was a big hit! For my next family crafting project I created yet another accessory for my sister’s knitting passion. A couple of years ago for her birthday I made my sister a set of bags and a needle roll to use for her knitting. The following Christmas (last year) I added some large project bags to her kit. Now I had to think of something unique to add to her accessories and I had just the thing in mind. 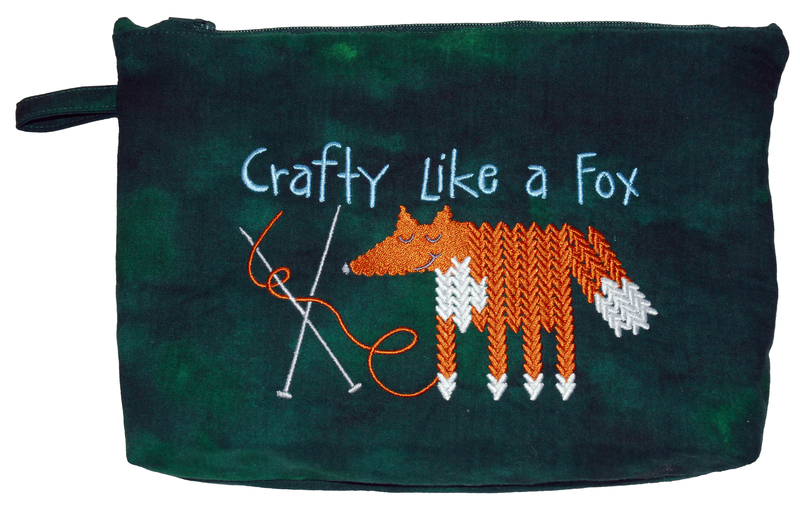 From the minute I saw this adorable Knitting Tweet embroidery I knew I wanted to put it on something for my sister and I finally had just the right thing. I know I already made her a roll up case to keep her needles in, but I wanted to give her a fancier one. I’ve already made a couple of similar cases for crochet hooks. One was for Madi’s mom and the other one is mine, but I haven’t written about them. I modified the crochet hook caddy by making it taller and the slots I created for the knitting needles vary in size. 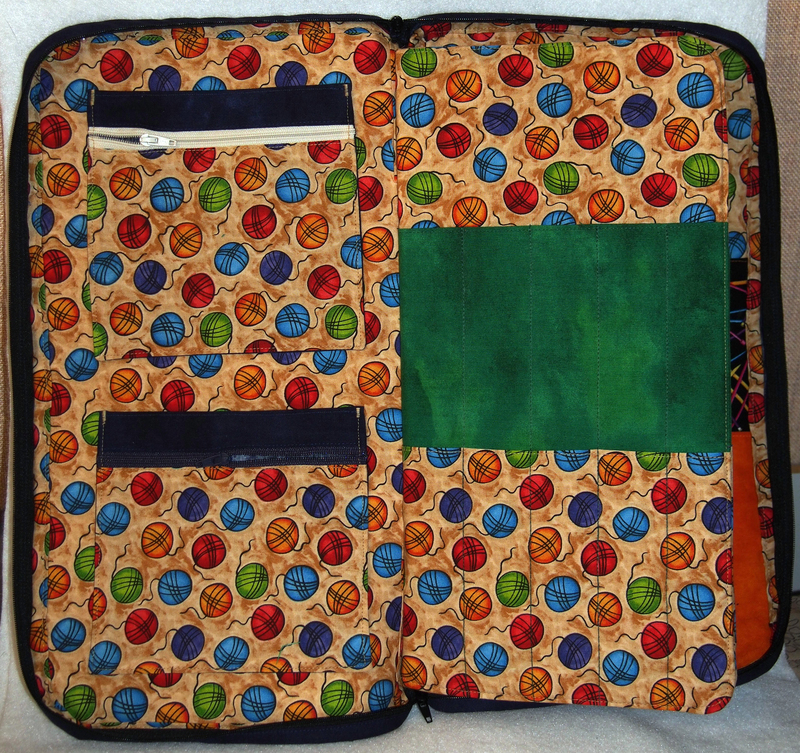 The first “page” has skinnier slots and two zippered pockets. The next two pages have only three slots on the left and two slots on the right. The final pages have full-page pockets on the left and two slots on the right. 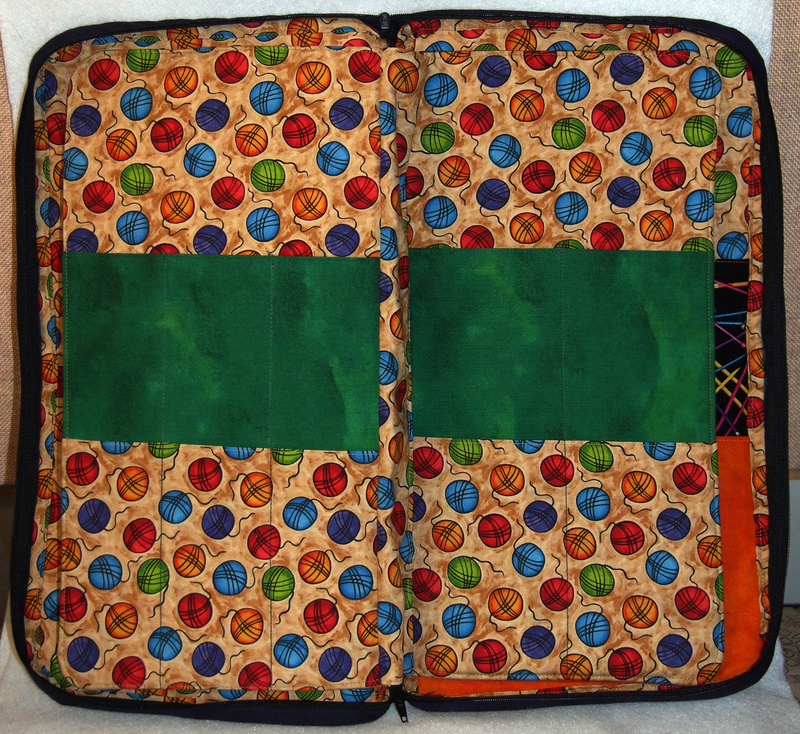 Since the case is so tall I created two sets of pockets for each page. That way there is room to put tall needles and shorter or circular needles. 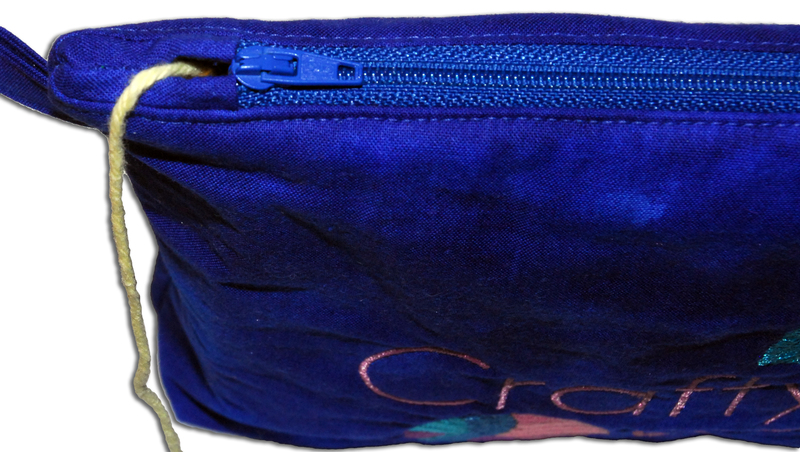 I also put a double-sided zipper that opens on three sides. Well I am happy to say that she was very pleased and has been rounding up her needles to fill it up. Millie also wanted to send some gifts to her canine and feline cousins. My sister brought home a new puppy when she and the family were visiting down south for Christmas and Millie wanted to give Rolo a proper welcome. 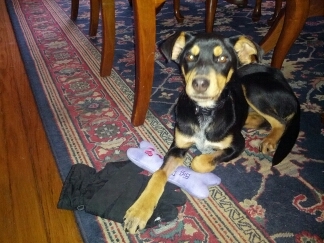 She really liked the fleece bone we sent and by the looks of it she also likes to play with someones gloves. 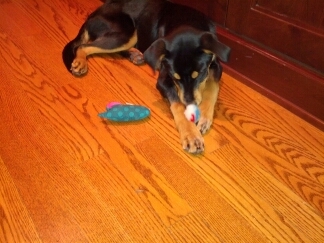 Rolo also thought it would be fun to check out the kitty toys we sent. Fortunately the kitties have also been playing with their new toys too. I love putting my heart into gifts for family and friends and overall I think the Christmas crafting was a big success. I hope I haven’t lost any of you yet by showing you all the projects I’ve been working on for the past couple of months in one week. This is the last one with the new projects and tomorrow I will show you the booties that Nina wears to keep from licking her paws raw from her allergies. Back in February I started making yarn project bags to sell. 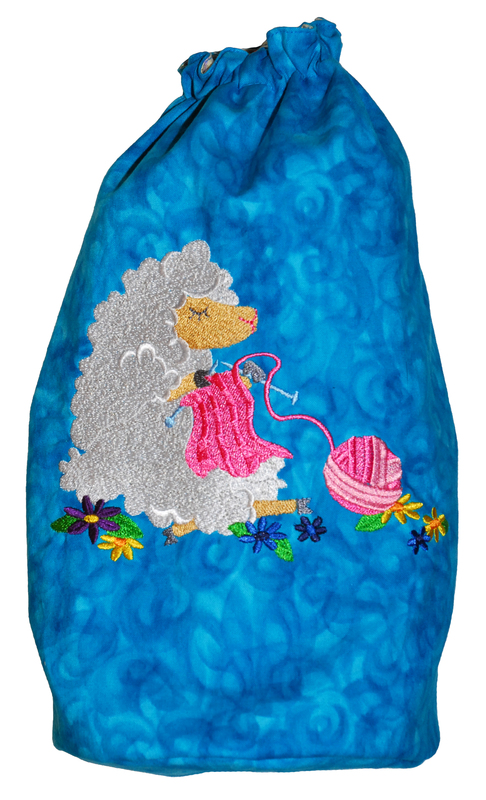 First to a yarn shop near where my sister lives and also to several fellow bloggers that requested custom bags. A couple of months ago I approached one of the local yarn shops The Village Yarn and Fiber Shop and asked if they would be interested in selling some of my bags on commission and they agreed to take 5 bags to sell. They accepted the four drawstring bags shown above and one clutch style bag. 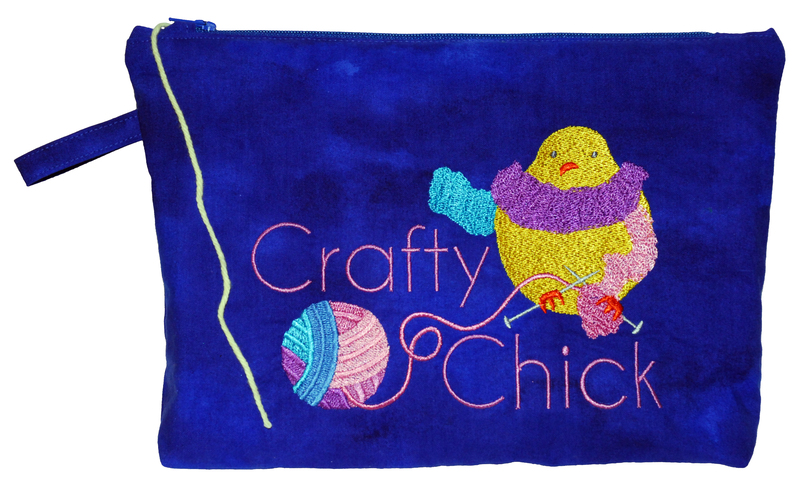 The clutch style bag has a new feature with an opening next to the zipper where you can pull your yarn through while you are working on your knitting or crochet project. I’m happy to report that within a month and a half four of the bags sold and they requested more. These are the new bags I brought them. I haven’t checked in recently to see how they are selling, but plan on doing so after the holiday weekend. I’m excited to be able to sell these bags locally, but I really enjoy making custom bags. 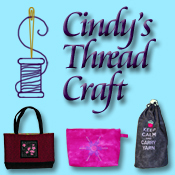 If you are interested in ordering a custom bag from me feel free to stop by my Etsy shop Cindy’s Thread Craft to place your order for a custom bag. 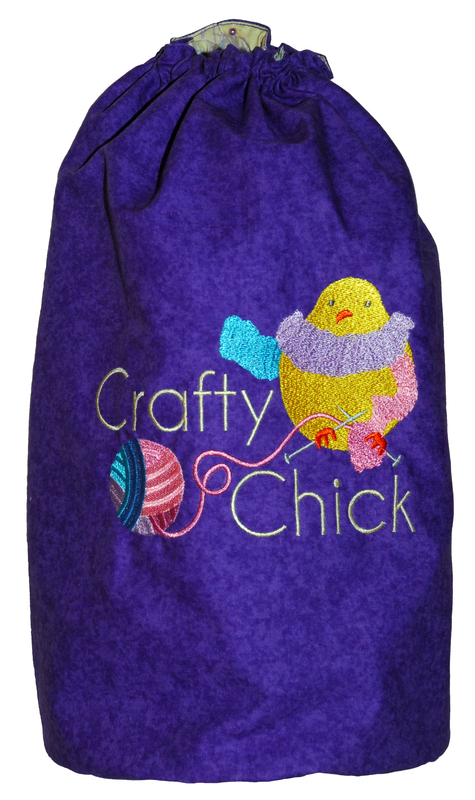 These bags are not just for yarn crafters but are great for carrying a variety of items. 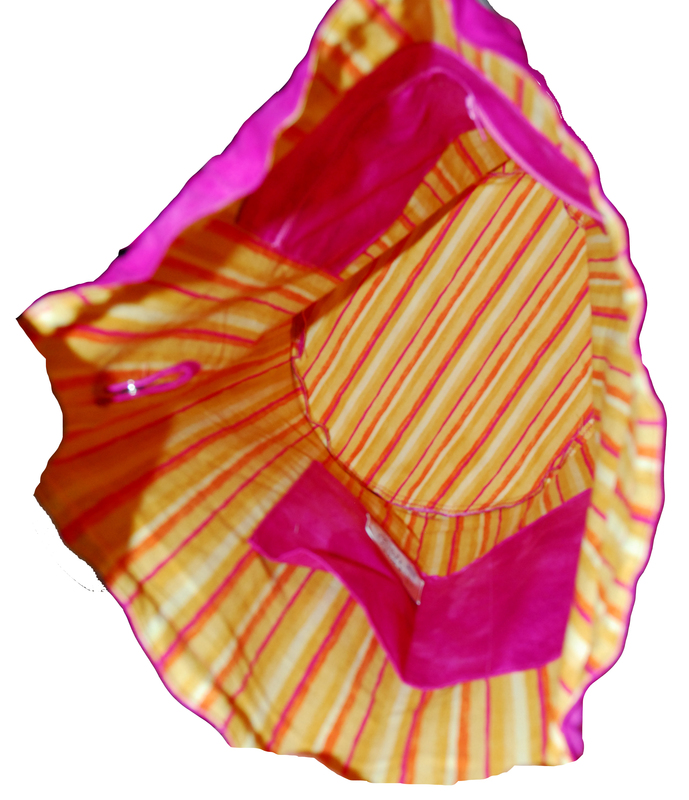 The drawstring bags can be used as a backpack and the clutch makes a great evening bag or camera bag. 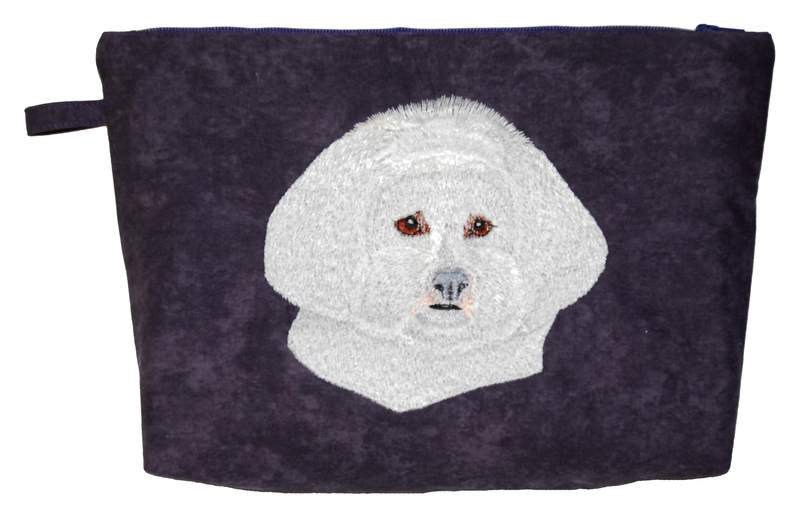 There are a wide variety of embroideries to choose from that include many dog breeds and other pet related themes. 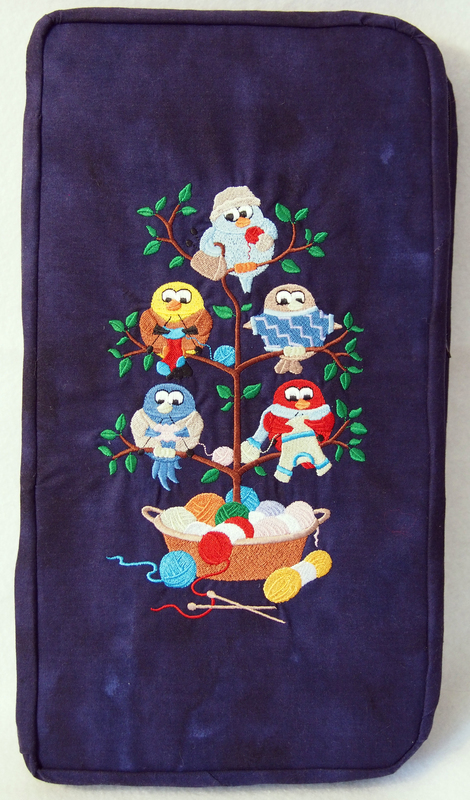 You can check out the embroidery designs at my Cindy’s Thread Craft blog. Don’t forget the holidays will be here before you know it so if you are interested in a bag as a gift for a friend place your orders soon. Hi everyone! I know it’s been a while since I posted last so I thought I would let you know what I have been up to. Last week was all about quilt clubs. I had meetings for both the clubs I belong to and a great class on Friday (I will tell all about that later). I am currently working feverishly on quilting my king sized quilt that was basted this past November so I can have it ready for the Perinton Quilt Guild show on May 12th. Before I started working on my quilting I made some more bags for customers. First on the list were bags for Agnes, What’s Her Name from Dachsies With Moxie. She has placed a large order that I will be working on over the next few months. Most of her items are for friends and family, but the first few things I made were for her. A sort of “thank you” for letting me help with the Fearless Five quilt. In case you didn’t know pink is Agnes’ favorite color. 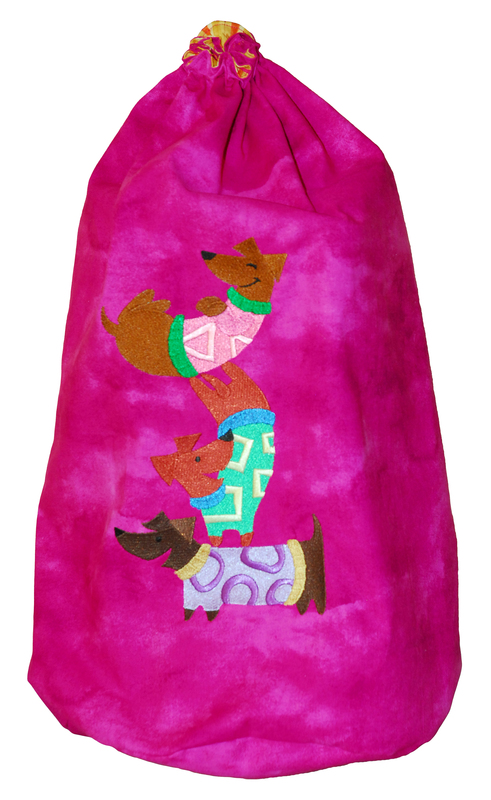 She had requested a large drawstring bag with a cute dachshund embroidery and a clutch with a sewing motif on it. I knew as soon as I saw that dachshund embroidery that I had to put it on a bag for Agnes. 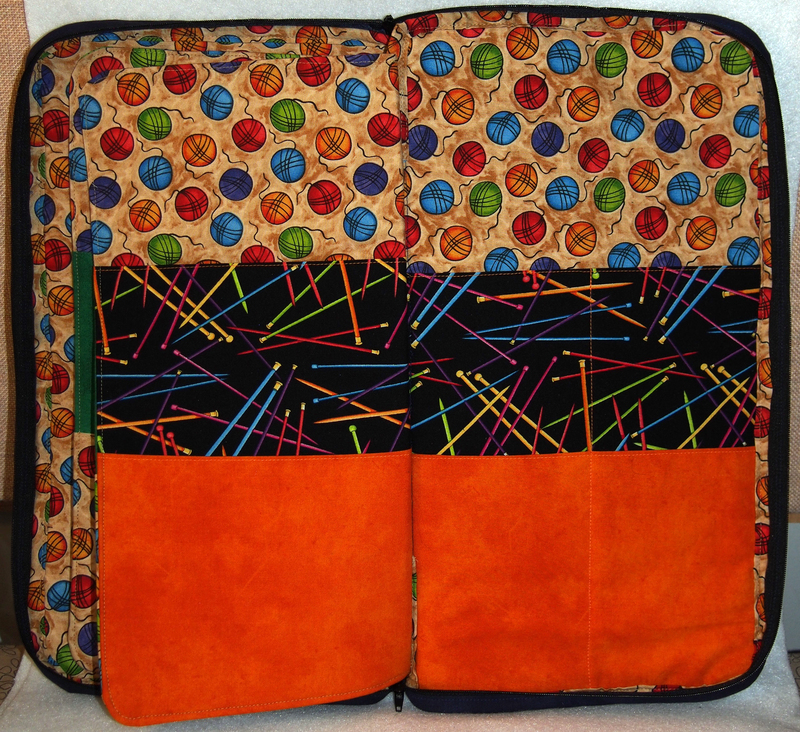 The interior includes a zippered pocket, a snap loop that you can hang your keys on and a large divided pocket. 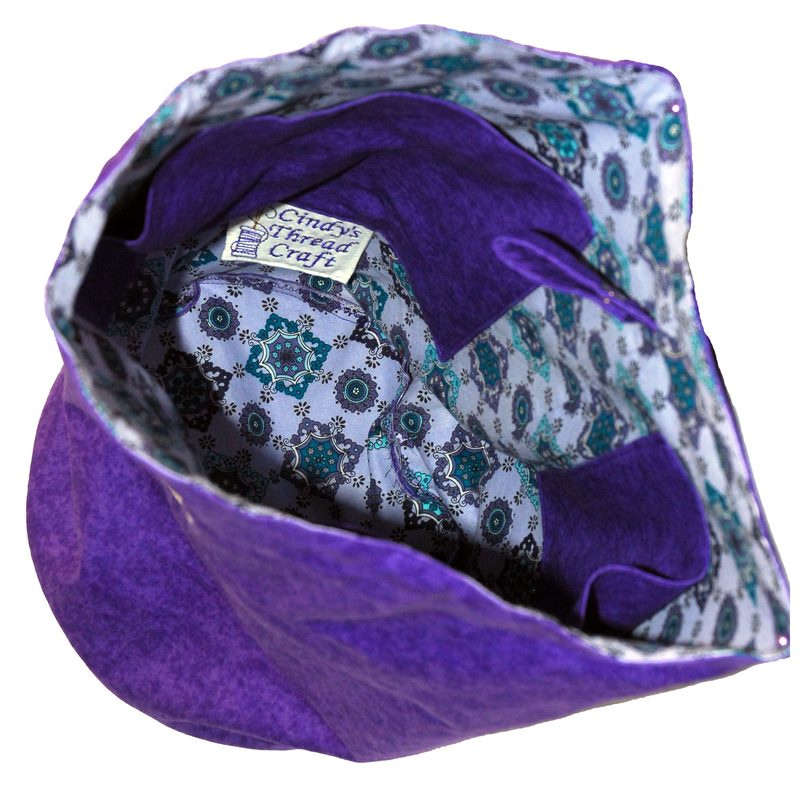 The clutch is about 10″ wide by 7″ tall and the interior has two open pockets. This bag is a great size to hold just the right amount of things for a quick trip out. 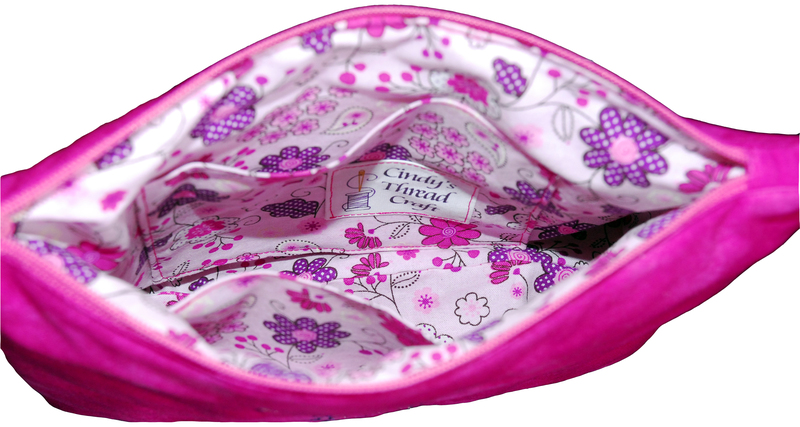 You can put your wallet in it, a camera, or your phone and be able put some of the accessories in the pockets. Agnes reports that she uses hers every day and loves it. As an added surprise I included a personalized key fob/wristlet. I embroidered “both” of her names on each side. This can be attached to the tab on the outside of the clutch to use as a wrist strap or you can put your keys on it. The next items on the order for Agnes were a pair of near matching clutches for a friend and her daughter that have a Bichon Frise. 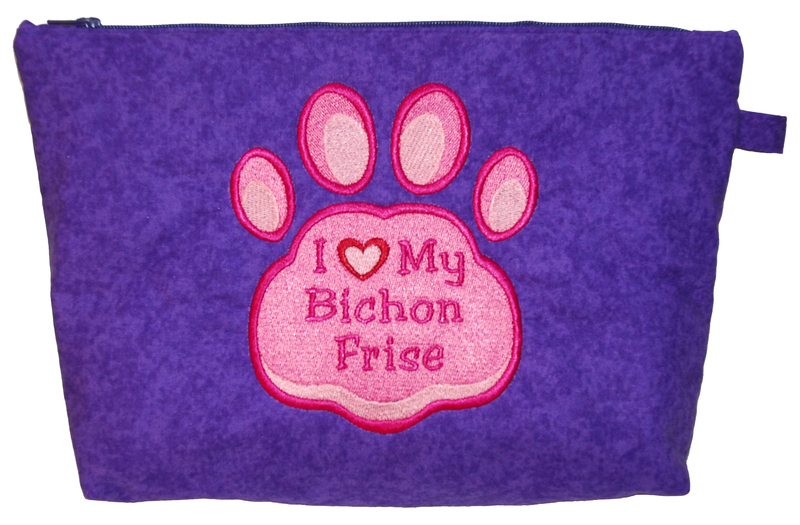 Both bags have the dog head on one side and the “I heart my Bichon Frise” on the other. 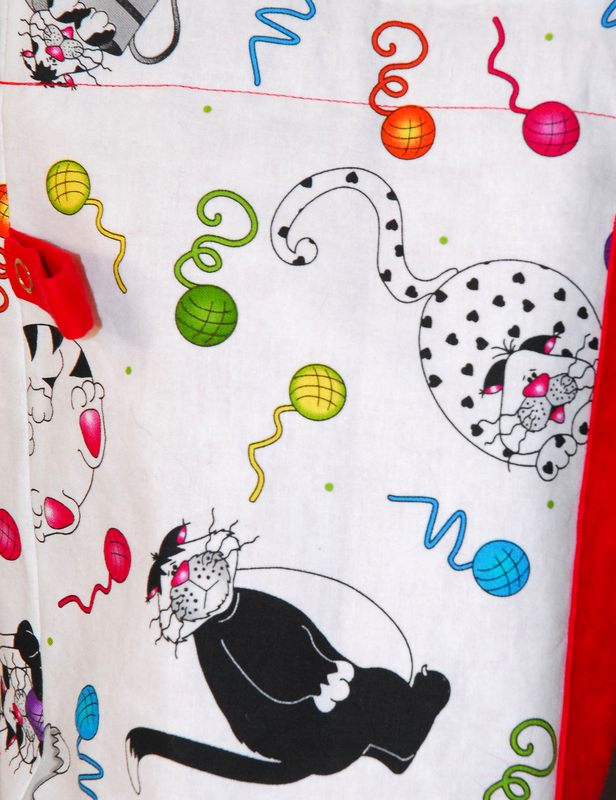 I enjoy picking out lining fabrics to enhance the look of the bags. Agnes said it was okay to blog about these bags as her friend doesn’t read blogs. Be sure to click on any of the images to see them at full size. Another bag I made was a clutch for my sister for her birthday. 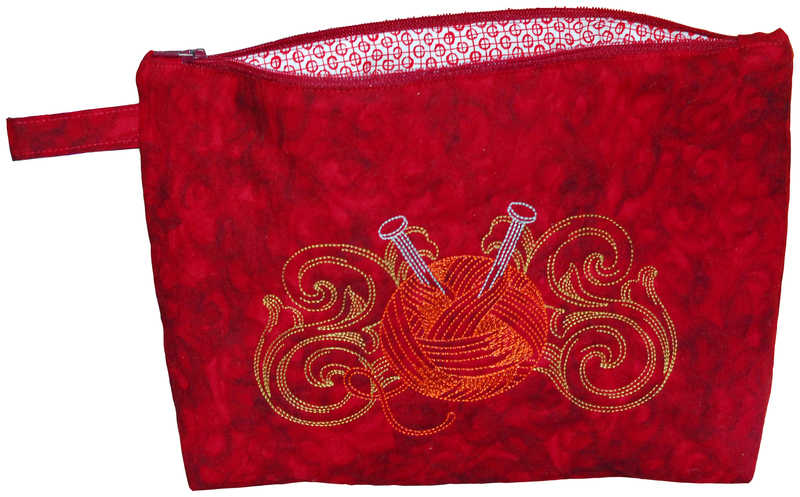 I used the same red fabric that I have for some other knitting bags for her so all of her bags would coordinate. 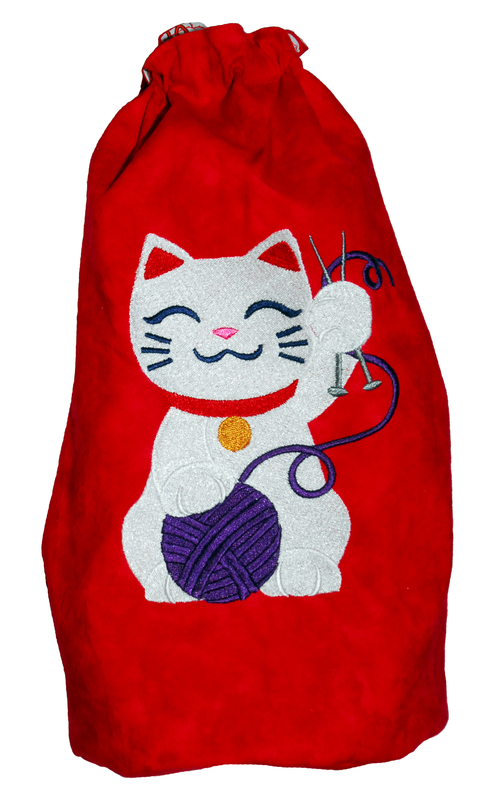 She is using it for a project bag for small knitting projects. The most recent bag I shipped out was to the Meowm of Junior, Orion, and Sammy. 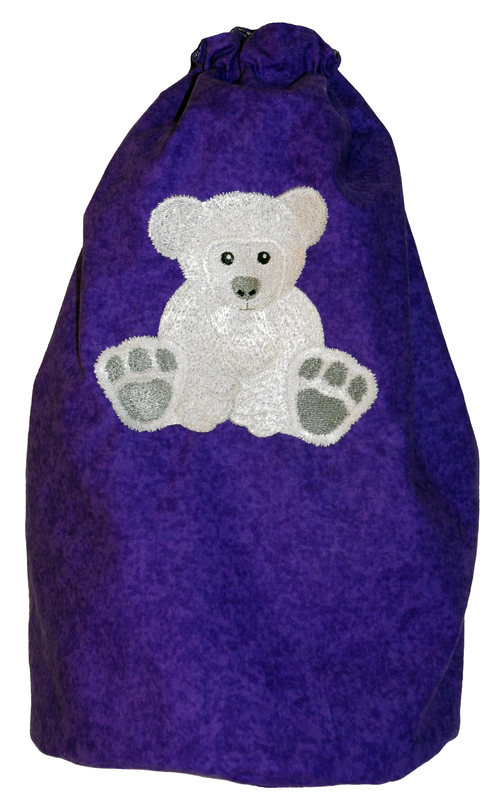 She saw the drawstring bags I made in an earlier post and wanted a medium-sized one with a polar bear on it. 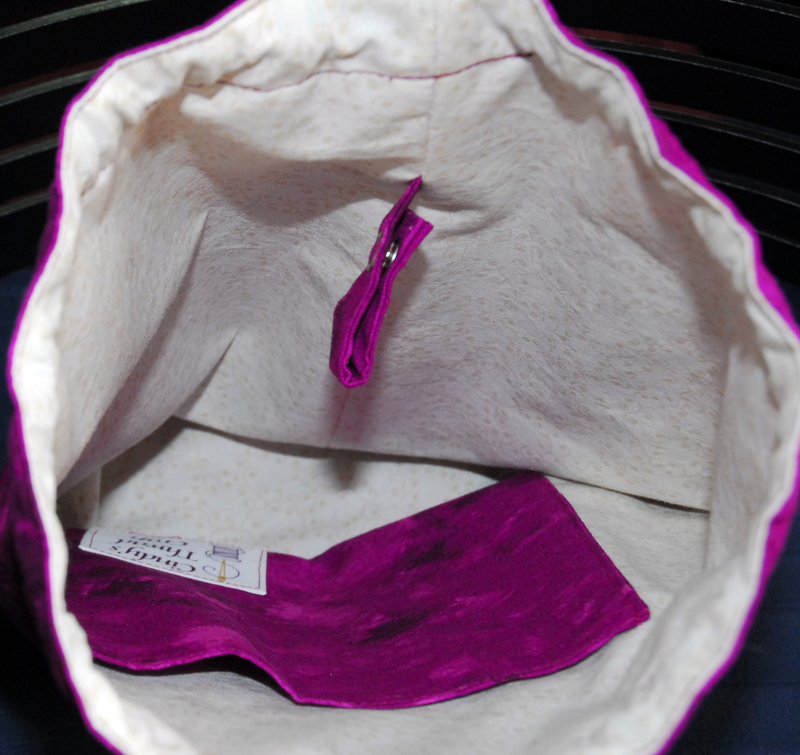 The interior has two big pockets with one of them divided into two smaller ones. I really enjoy making all these bags. If you are interested in buying one just let me know in a comment and I will contact you for details. 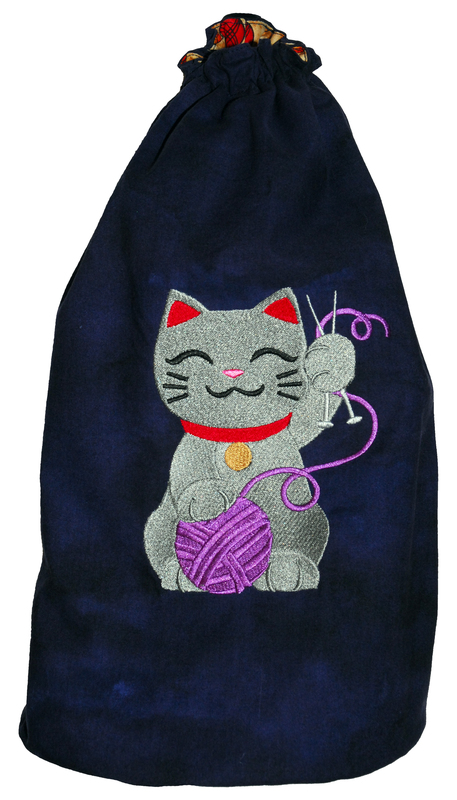 I have a wide variety of embroidery motifs, or the bags can be done without any embroidery on them. I will be setting up an Etsy shop soon to make selling the bags easier for me and you. 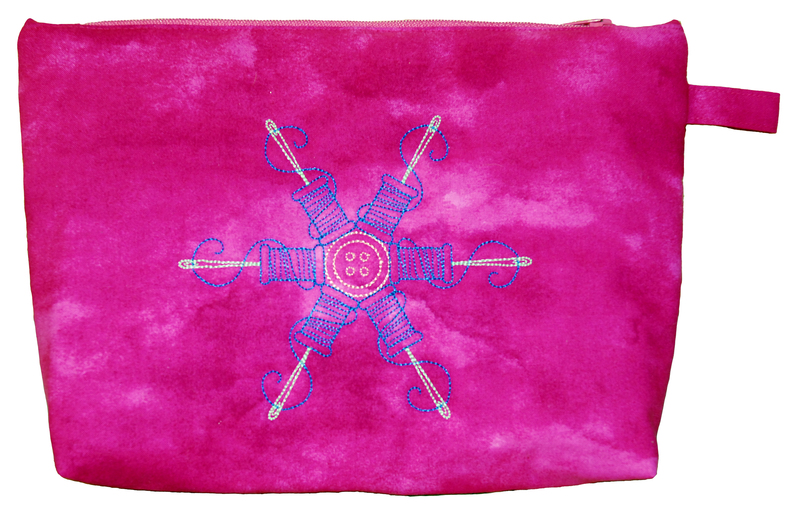 Stay tuned for more sewing and embroidery fun tomorrow. Before I get to today’s post I wanted to answer the question I posed on Wordless Wednesday. A few of you were correct in guessing that the mess on the floor was a couple of piles of Nina’s fur. She is a double coated dog and is shedding like a fiend right now so I used an undercoat rake and that was what came out. 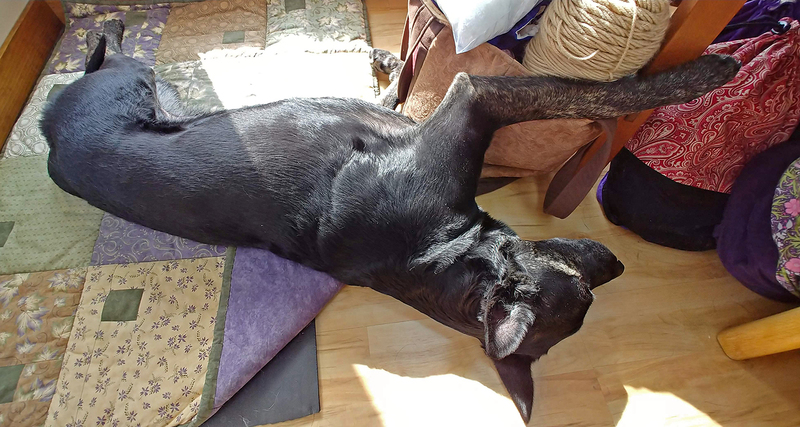 Surprisingly enough as a dog that looks solid black on the outside, her undercoat is mainly a light grey. She still has a lot of shedding and brushing to endure. 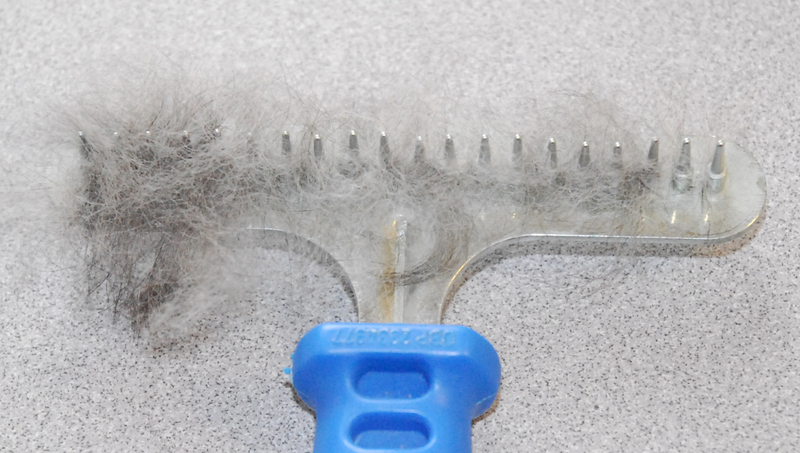 When the weather is nicer we like to do the brushing outside and leave the fluff for the birds. Note to Remington: If Beth would like some extra fur to weave with yours I would be happy to bag it up for you. Nina’s fur is extra soft so it could only complement your own fur. 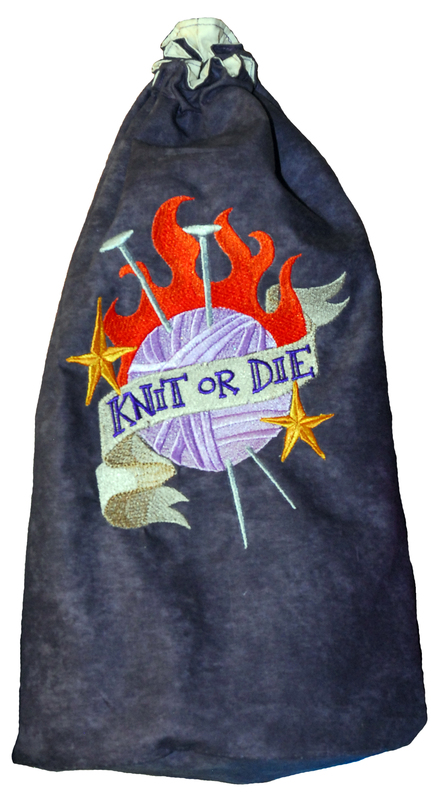 This week I shipped my first order to a paying customer for one of my drawstring project bags and I am happy to report that she is very satisfied with her bag. I made this bag for Miss Madi’s mom Cecilia who likes to crochet mini afghans that she donates to her local humane society for the kitties to snuggle with until they find their forever homes. I love the way this turned out. My favorite feature would have to be the lining fabric. 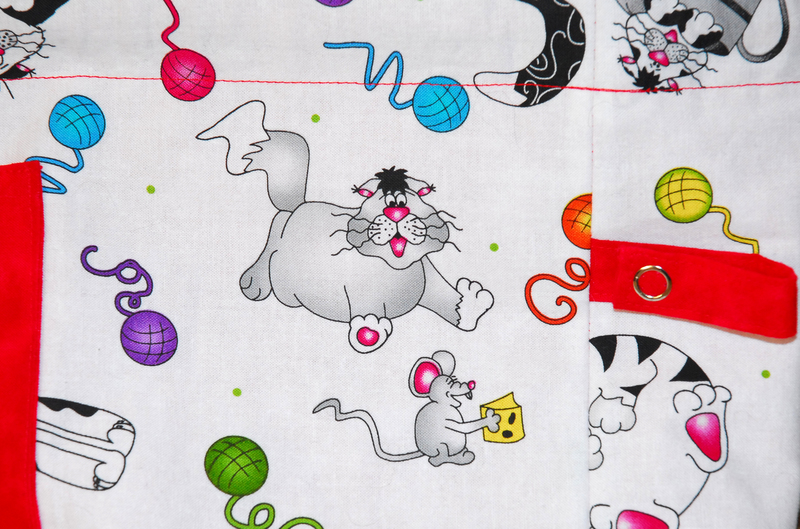 I was at one of my local quilt shops during a sale and saw this fabric and knew I had to get it for this bag. The snap loop in the above picture is used to feed the yarn through to keep it neat as you pull it out of the bag. Of course I got more fabric than I would need for this bag so it will likely show up again in another bag sometime. 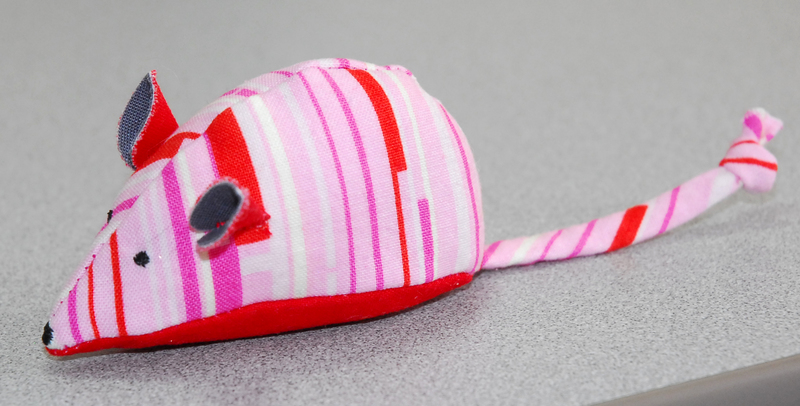 As an added surprise I included a handmade mouse filled with catnip for sweet Madi. You must visit her blog to see just how much fun she had with it! I can’t help but smile looking at all those pictures of Madi playing with the mouse and the commentary is very funny too. 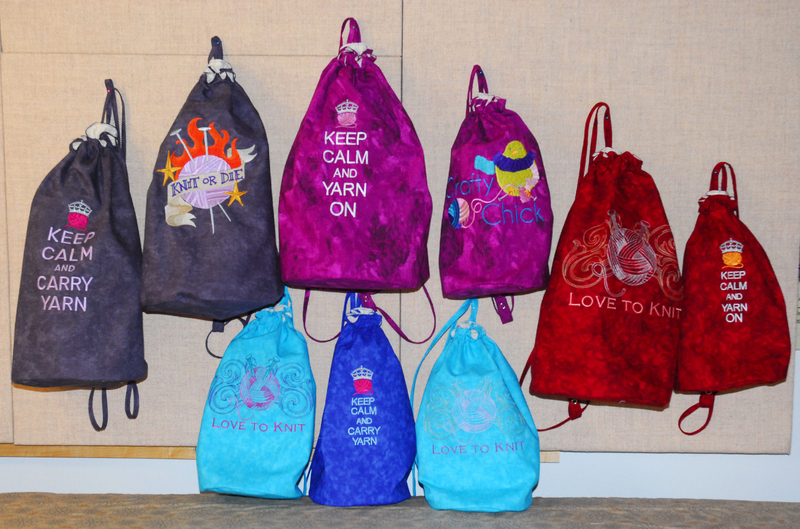 If any of you are interested in owning one of your own customized drawstring bags feel free to contact me regarding pricing, sizes and available designs. 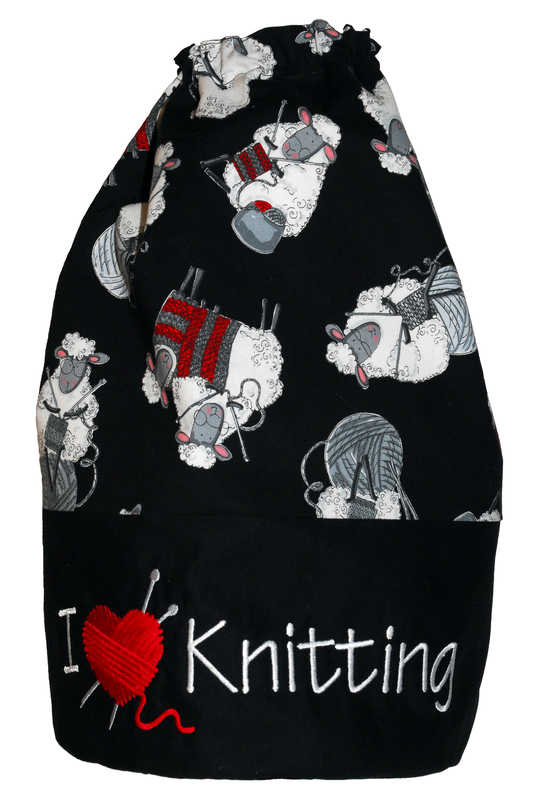 They don’t have to be used as knitting or crocheting bags exclusively. 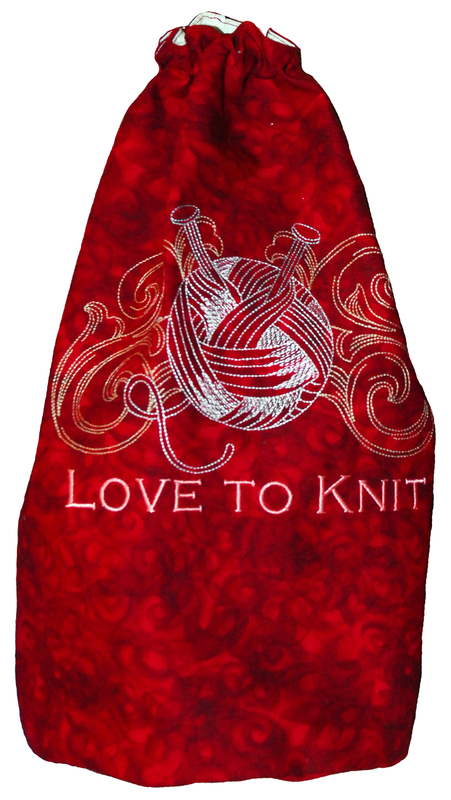 I am currently working on a few new orders so stay tuned for more fun creations. I am also working on setting up an Etsy shop to make the process easier and I will let you all know when that is ready. Thank you Madi and Mom for being my first customers. It has been a pleasure to work with you. My sewing machine has been getting quite a workout lately doing both machine embroidery and sewing and this is the reason. A few weeks ago my sister called to tell me that she had just come from a visit to her local yarn shop The Wool and The Floss in Grosse Pointe, Michigan and had an interesting exchange with the shop owner. Colleen (my sister) had one of the project bags I made for her for Christmas with her and the owner of the shop asked her where she got it. She told Jean (the shop owner) that I had made it and a couple of others as gifts and Jean asked her if she thought I would like to sell some. Colleen said she didn’t know for sure, but that she would call me to see what I thought. I thought, why not! So I called Jean to see what size bags she would like and told her I would try to get some to her by this coming weekend since I knew she had a big event to attend where she would have a booth to sell things. Jean really liked the embroidery on Colleen’s bag so I used that and a few other cute embroideries I got from Urban Threads and Embroidery Library to embellish the bags. I mailed out 4 medium and 5 small bags and I just checked to see that they were delivered! 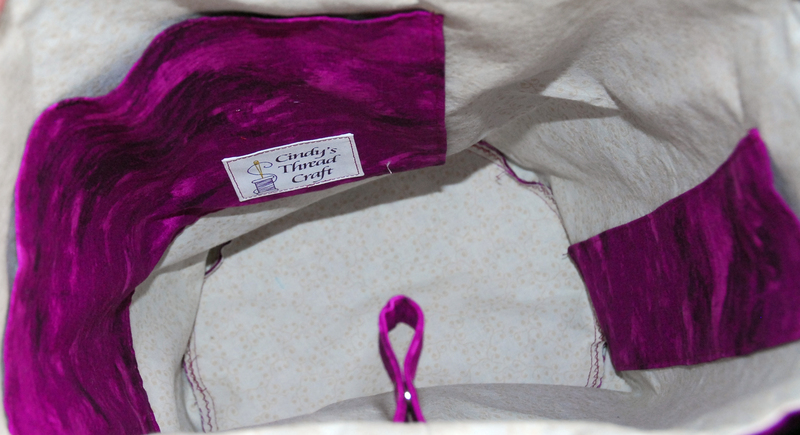 After a short discussion with Jean I decided to add some features to the bags from what I made for Colleen. I had asked Colleen if she wanted any pockets and at the time she said she didn’t need any, but I decided to add some pockets in these new bags. For the medium bags I put a tall skinny pocket that can be used for putting knitting needles in and a large square pocket for putting a pattern or other notions you might need to keep with you. 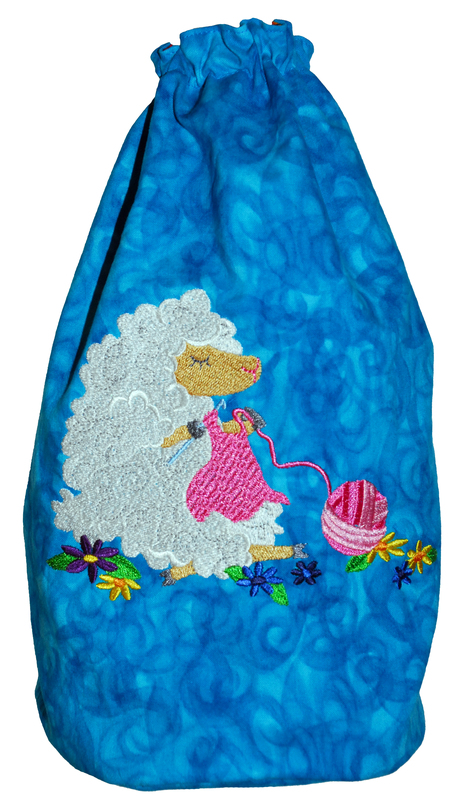 The small bags just have one large square pocket and both bags have a snap loop that you can put your yarn through so it feeds out of the bag nicely. 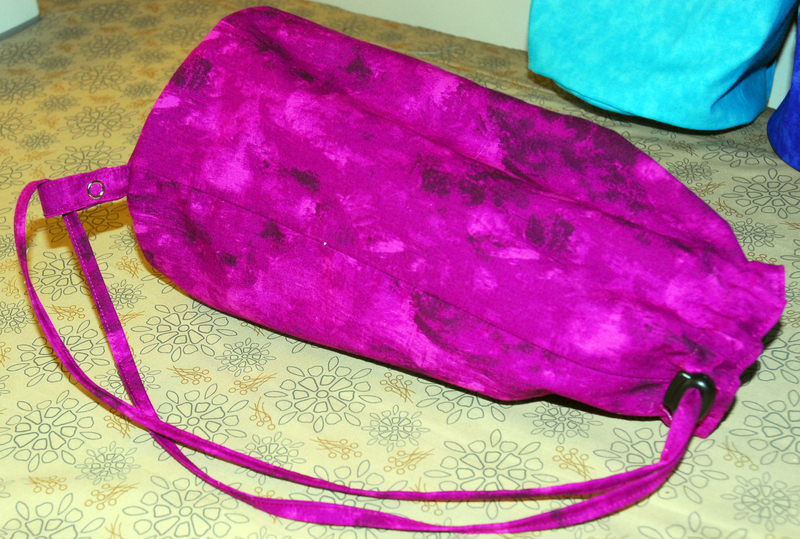 I also made one addition to the exterior of the bag, by adding a snap loop and sewing the drawstring into a loop. With the drawstring fed through the snap loop it becomes a nice handle or shoulder strap to carry the bag with. I love the way these came out and plan on making a bunch more. If they sell well at The Wool and The Floss then I will ship out some more to her. I also plan to see if I can sell some to yarn shops in my area and also start selling them on Etsy. Oh yeah…I also came up with a name for this enterprise. Well actually my Chief Creative Consultant, aka my husband Charlie, came up with the name Cindy’s Thread Craft and this is the label I made to go inside the bags. Of course the label design was Charlie’s idea too. 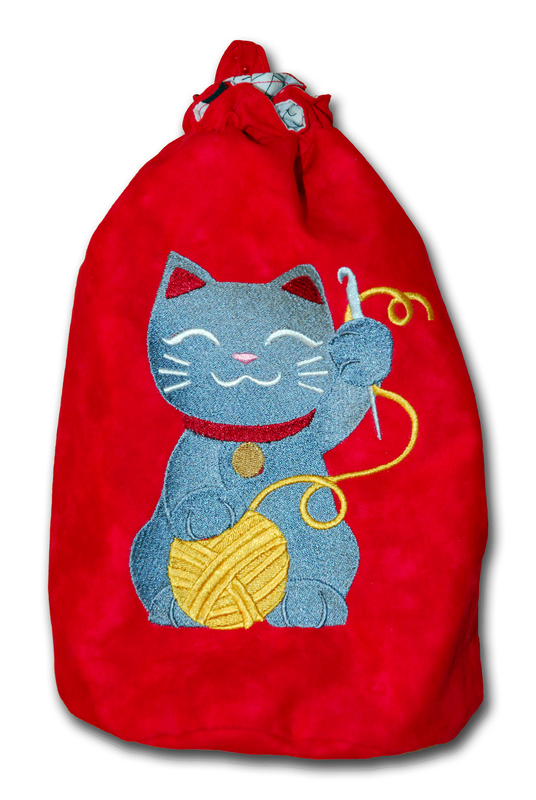 The bags are being sold on commission so wish me luck that these sell so I can make my millions sewing knitting bags! I know dream on, but it is a lot more fun than sitting behind a desk somewhere. So if you are in the Detroit area stop by the shop and say hi to Jean or visit the Knit Michigan event this Saturday and find her booth.